"Seven segment display”, consists of seven LEDs arranged in a rectangular form. Each of the seven LEDs is called a segment because when light up the segment forms part of a numerical digit to be displayed. some the seven segment displays contains eight LEDs instead of seven. An additional 8th LED is the 'dot'(decimal point). A single seven segment display contains 9 or 10 terminals, 8 terminal for segments(including decimal point) and 1 or 2 pins are common pins, a seven segment is categorized with this common pin either Common Anode or common cathode. Common anode seven segment display has Positive terminal as common pin while all other are cathodes(negative) terminals Common Cathode seven segment display has -ve terminal as common pin while all other are anodes(positive) terminals. . This is simple circuit which contains two digits Common anode seven segment displays this will count the number from 0 to 99.In this project AT89C51\S52 is connected with multiplexed common anode display. 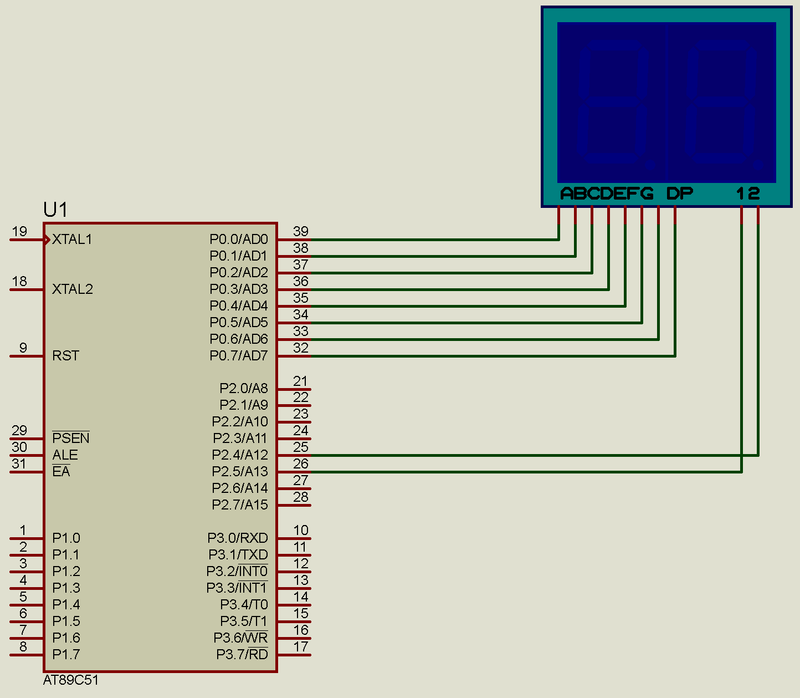 Port 0 of microcontroller is attched with the segments of display while common pins are controlled by port2.4 and pin2.5.when a program is executed it will start counting from 01, right most seven segemnt display will increment the number by 1, when that display overflows or reached at 9 and the resets to 0 this will generate a carry that will hit another segemnt to count by 1.and same way a complete sequence will run upto 99 and then resets to 00.